LANDMARK wedding anniversaries often see couples showered with gifts from friends and family. But for one couple, their ruby wedding celebrations were the perfect opportunity to help the rugby club they love. 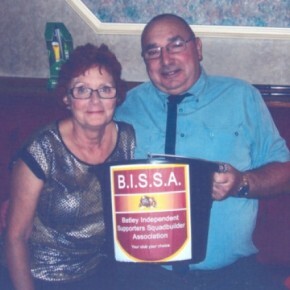 Instead of presents, devoted Batley Bulldogs fans Dave and June Wells asked for donations to the Batley Independent Supporters’ Squadbuilder Association (BISSA). The association raises money for the team’s coach to obtain and keep top players, with incentives offered to players over and above what the club has budgeted for. Donations from guests at the Wells’s anniversary party at Batley Central Club in Bradford Road raised £350 for BISSA. Dave, 61, said their loved ones were happy to go along with the unusual gift idea. He said: “They were surprised but they warmed to it as soon as they found out what BISSA stood for. Dave and June, of Healey, first met on a blind date at the Black Horse Inn in White Lee and married three years later at Dewsbury Register Office. They now spend their retirement supporting their favourite team at home and away and decided raising money for the association would be the perfect way to mark their anniversary. BISSA chairman Colin Bottomley said the association was blown away by the gesture.